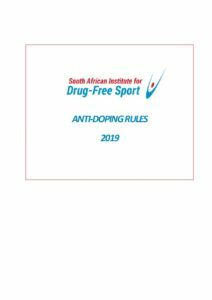 On Wednesday 20th March 2019 SAIDS CEO, Mr. Khalid Galant, sent an important communication to National Federations notifying them of the newly updated South African National Anti-Doping Rules: 2019 that are applicable to all national sports federations. These national rules have been certified as code compliant by the World Anti-Doping Agency (WADA). These Rules shall be effective as from the 1st May 2019. Federations that are members of the South African Confederation of Sport and Olympic Committee (SASCOC) automatically fall under the jurisdication of these national rules. The application of these rules apply to all national sports federations and do not conflict with the anti-doping rules that the respective international parent bodies have adopted. As per these rules, independent doping hearing panels adjudicate all national anti-doping cases where the athlete is afforded an opportunity to submit a defence and engage with his/her legal counsel. During these hearings, the respective national federation is always afforded observer status to the proceedings. In his communication Mr. Galant urged the National Federations to designate at least two officials in their executive management structure to be familiar with these rules and its application so that each sports entity is aware of their rights and obligations. Federations will then be better able to advise their athletes on their rights should any of them transgress the national anti-doping rules. Mr. Galant invited Federations to request an information session on these Rules to be presented to their affliates, athlete support personnel or athletes. A reminder, that our website contains more information on the list of substances and methods that are banned in sport, as well as additional educational resources, including e-Learning resources specific to athletes and their support personnel.